A thriving old market town, strung out along the A429, which holds the largest open-air Street Market in the Cotswolds. Its tree-lined main thoroughfare is part of the old Roman Road and Medieval highway known as the Fosse Way. Elegant 17th/18th century honey-coloured stone houses, hotels and inns, line either side of the wide High Street, which includes a good selection of small independent shops, tea rooms, bistros and restaurants. An ideal place for a wander around, particularly on Tuesdays when it's market day. The settlement developed in the early 17th-c as an important staging post on the road between Bath and the Midlands, as indicated by the many old coaching inns that still survive here. Among several interesting establishments is the White Hart where Charles I spent a night in 1643, and the Redesdale Arms, a famous old coaching inn. J R R Tolkien was a regular visitor to the town and often supped at The Bell Inn. It is believed that this old public house was the inspiration for Tolkien's Prancing Pony - Middle Earth's most famous pub in the 'Lord of the Rings' trilogy. In the centre of the main road is the town's oldest building the Curfew Tower, which includes a lock-up used as recently as 1860. The tower's bell was rung nightly to remind people of the risk of fires. 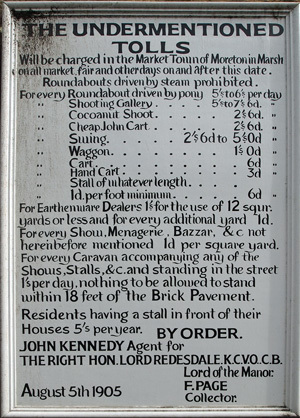 A plaque on the side of the tower lists the original market tolls from August 1905. Redesdale market hall (shown above right), was constructed in 1887 in a Tudor Style by Sir Algernon Bertram Freeman Mitford, the 1st Baron of Redesdale. The Hall is run by a charitable trust and is available for hire. Moreton in Marsh town station is connected to the main London Paddington railway line. Making this beautiful Cotswold town a very desirable commuter hub. The Moreton-in-Marsh Show, a major one day Agricultural and Horse event, is held here annually in September.